That's the complaint I've already received from my husband in regards to my cooking. He seems to think he is still a hospital patient and should be able to pick from several choices on a menu. I'm not a short-order cook but it looks like I'm on my way. Tonight's menu special was fried rice. 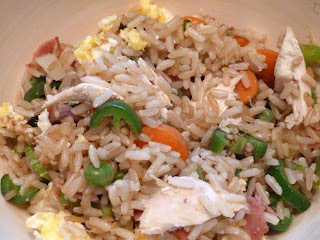 Brown rice tossed with carrots, peas, celery, onions and peppers from the garden, a bit of turkey bacon, some chicken, and a scrambled egg. Having not used brown rice before there's only one thing to say. Yum.